KAMPALA. 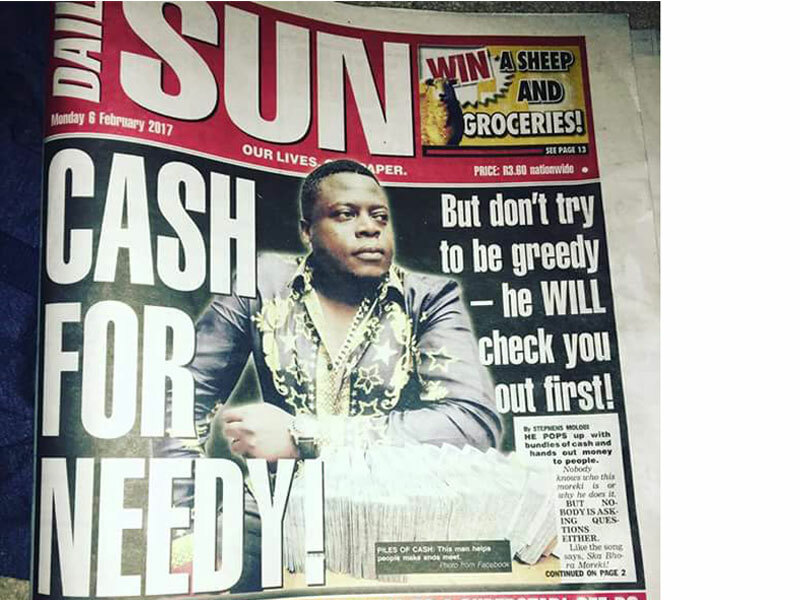 On February 6 Ivan Ssemwanga made it on the cover page of South African tabloid Daily Sun. But the tabloid could not identify him. According to the story they had located his contact on a Facebook page and rung him up. In the feature in which Ssemwanga’s picture posing with wads of cash was pasted across the entire face of the newspaper’s cover, Daily Sun said they had managed to track down “the man people call moreki on the phone.” Moreki is a Setswana word for ‘giver’, ‘consumer’. He would not disclose his real name or where he came from, but insisted what he is doing comes from the heart,” the tabloid said. Daily Sun might have failed to identify him, but Ugandans could not fail to spot the flamboyant man who wore a poignant look in most of his photos, the man best known for being the father of Ugandan socialite Zaituni Kirigwajo, aka Zarinah Hassan Tlale, aka Zari’s three sons. He was Ivan Ssemwanga. Sadly, Daily Sun and the many South African needy who benefited from his big heart without really knowing who was dishing out rands to them will learn that we are identifying him in the past tense. And Ssemwanga will never be ready for the Daily Sun interview. He is no more. Ivan Ssemwanga lived large. Larger than life. But there is no one larger than death. No one who can live larger than death. And so this morning, the Angel of Death decided on his fate. The flashy businessman was pulled off life support at Steve Biko Hospital in Pretoria, South Africa, and pronounced dead. His former fiancée Zari announced the passing on of the Don of the ‘Rich Gang’ on Facebook today. Ssemwanga was admitted to Steve Biko Hospital 11 days ago after suffering a stroke. The news of his condition would fan across East Africa like a Kenyan circus after Zari went to attend to his bedside. The deceased was later operated on, with a leaked picture of him in hospital showing signs that the operation was on his brain. He went into a coma. On Tuesday, doctors reportedly advised the family to let go, with the news quickly leaking to public as social media declared Ssemwanga had passed on. But Zari, biding time, refuted the rumours and instead called for more prayers. The family used the window allowed by doctors to make preparations and accept the reality and, Thursday morning, they okayed doctors to pull Ssemwanga off the life support machine. Born on December 12, 1977, in Kayunga District, Ssemwanga left for South Africa to find his footing in 2002, reportedly passing through Zambia. After going through travel ordeals with immigration, Ssemwanga settled in Pretoria with the help of his cousin. Not much is known about how Ssemwanga he acquired his wealth, with various accounts suggesting he was one of the Sangomas (native healers) who targeted rich clientele. Other accounts suggest Ssemwanga and his member of the Rich Gang Shaffiq Katumba, Edward Kyeyune and others made a killing off holding siphoned funds on behalf of corrupt officials and getting commissions. However, what cannot be disputed is that Ssemwanga had made it in life. He was not short of money and he did not shy from flaunting it. He also gave generously. By 2010, he was solid enough financially to carry a truckload of head of cattle for Zari’s hand. Together with Zari, Ssemwanga was the proprietor of a string of franchises in both South Africa and Uganda. His two mansions in Sandton and Pretoria were eye-catching and the Brooklyn Colleges with six branches across Durban, Pretoria and Johannesburg provided any cover for wherever allegations cropped up that their wealth was fishy. His big palms were the gift of giving. From the charitable act that saw Daily Sun give him the front page feature to Nsambya children’s home, Ssemwanga was always wearing coy smile and giving. At one point, he also splashed cash to Uganda Cranes. Ssemwanga became synonymous with social life. He was the kind who would fly from South Africa to be present at Guvnor just because a few tabloids had mentioned an event. As social gatherings, he always carried large bottles of expensive wines, making the timid fellow appear more or less like he was into the social flings due to peer pressure. Ssemwanga’s cousin and one time benefactor, Edward Kyeyune, spoke of the happiness the late bought to the group [Rich Gang] whenever he was around. “You spread happiness for all the years when you were here with us all, Now it is God’s turn to give you all the happiness in return as you go holding his hand .Rest in peace my brother Ivan Ssemwanga,” Kyeyune said. The 39-year-old’s body is expected to be returned to Kampala tomorrow ahead of his burial on Sunday.